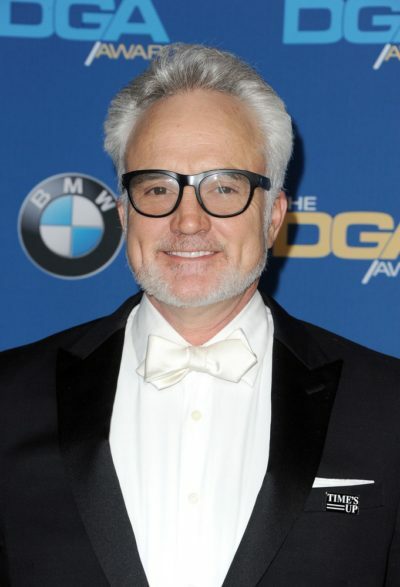 Bradley Whitford is an American actor and liberal political activist. Bradley is the son of Genevieve Louie (Smith), a poet, and George Van Norman Whitford. He has three children with his former wife, actress Jane Kaczmarek. Many of Bradley’s family lines trace back to New England (Massachusetts, Connecticut, Vermont) of the 1600s. He was raised Quaker. Bradley’s paternal grandfather was George Sommers/Summers Whitford (the son of Carlos/Charles B./Pedro Whitford and Helen Louise “Ellen” Summers/Sommers/Summer). George was born in Wisconsin. Carlos was the son of Cyrus Beaman Whitford and Laura Adelia Carpenter. Helen was the daughter of Laurel Summers and Mary Parkhurst. Bradley’s paternal grandmother was Kathleen E. Van Norman (the daughter of Henry Clinton “Harry” Van Norman and Mary Elizabeth “Minnie” McBurney). Kathleen was born in Colorado. Henry was born in Port Hope, Ontario, Canada, and was the son of George Robinson Van Norman and Margaret Ann Berry. Bradley’s great-grandmother Mary Elizabeth was also Canadian, and was the daughter of John McBurney. Bradley’s maternal grandfather was Howard Remus “Harry” Smith (the son of Fredrick/Frederick Hart Smith and Mary Selina Burr). Howard was born in Michigan. Fredrick was the son of Azariel/Azariah Smith and Mary Andrews. Bradley’s great-grandmother Mary Selina was the daughter of Eli Remus Burr and Susannah Monogal/Monagle. Bradley’s maternal grandmother was Hazel Ruth Neu/New (the daughter of Fredrick Louis “Fred” Neu and Ida M. Venner). Hazel was born in Nebraska. Fredrick was the son of Johann Georg Friederich “Fred” Neu, who was from Ottweiler, Neunkirchen, Saarland, Germany, and of Charlotte S. Schwartfuger/Schwertfager, who was of German descent. Ida was the daughter of George W. Venner and Martha Ellen/M. Schuck.